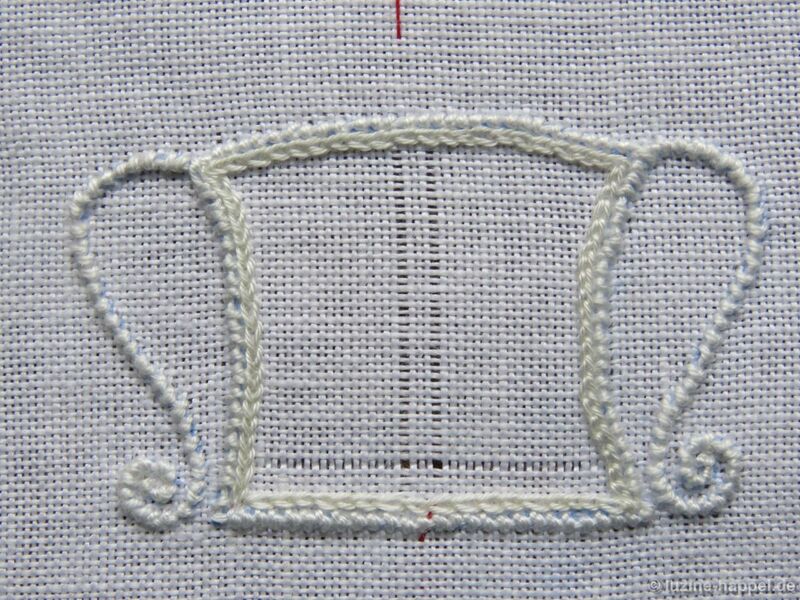 The first lesson on how to establish a Limet grid dealt with the basic knowledge needed for working Limet patterns on the straight of grain with an intersection of withdrawn-thread lines in the center or a withdrawn-thread line as the center axis. 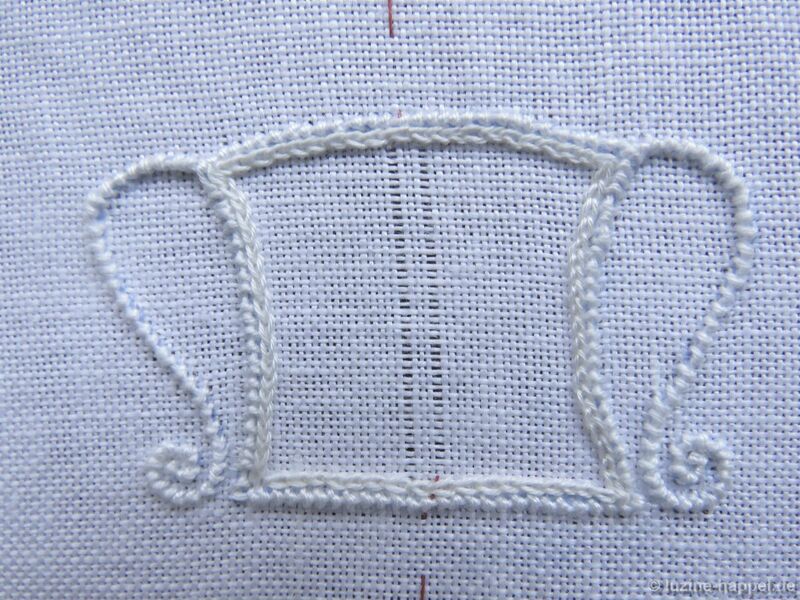 Now I will present the second installment of Limet grid basic knowledge. 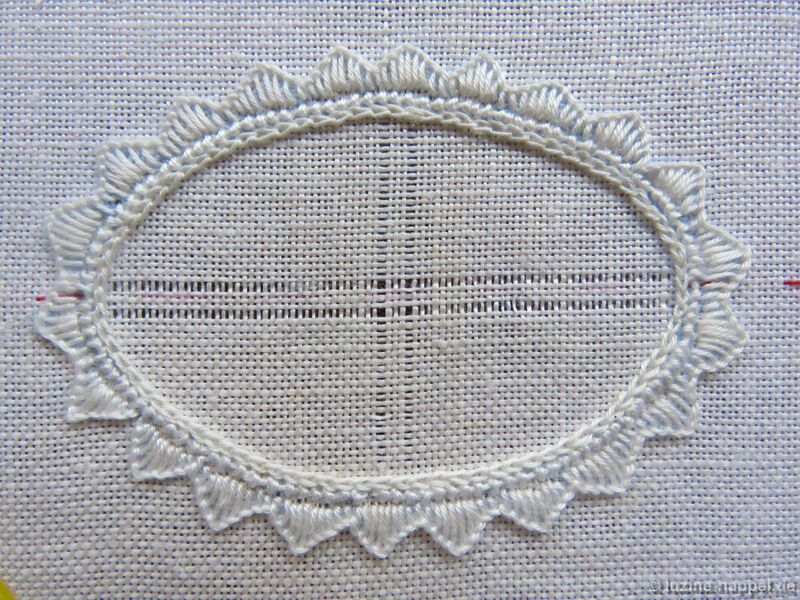 As already mentioned, a pattern embellishment in a symmetrical shape will look perfect only if it is symmetrically arranged. 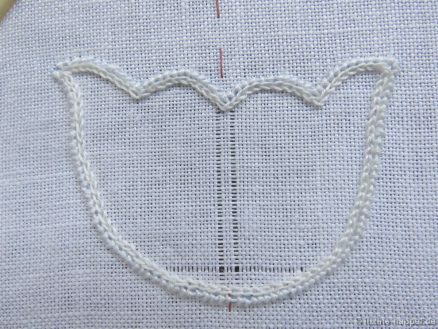 In addition, different patterns need different grid preparation. 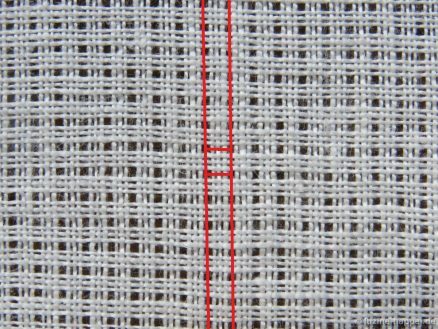 Below are the instructions for Limet grids needed for patterns on the straight of grain with a square in the center or a group of three threads as the center axis. 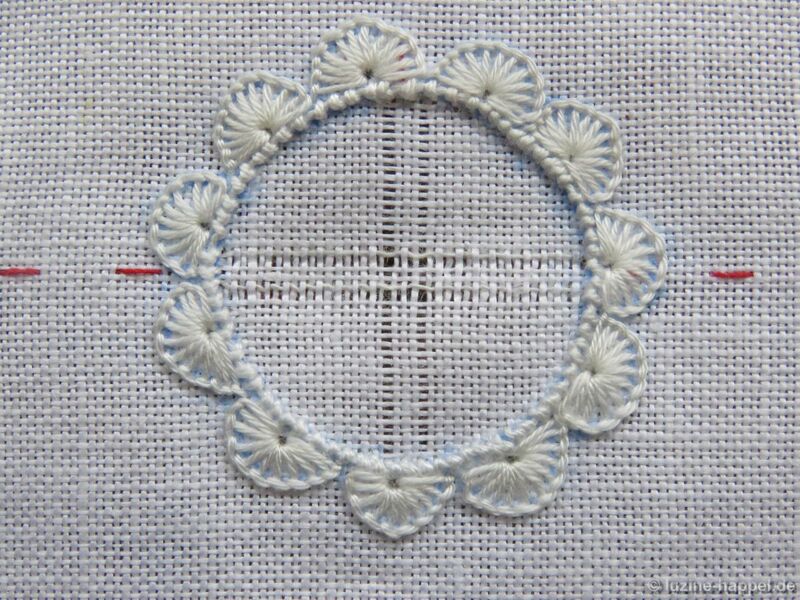 Circles, ovals, and squares are point symmetric; they need a square at their centers from which the pattern can radiate in all directions. 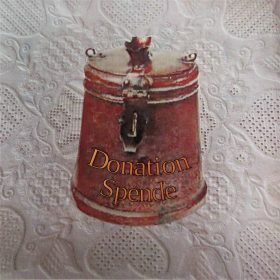 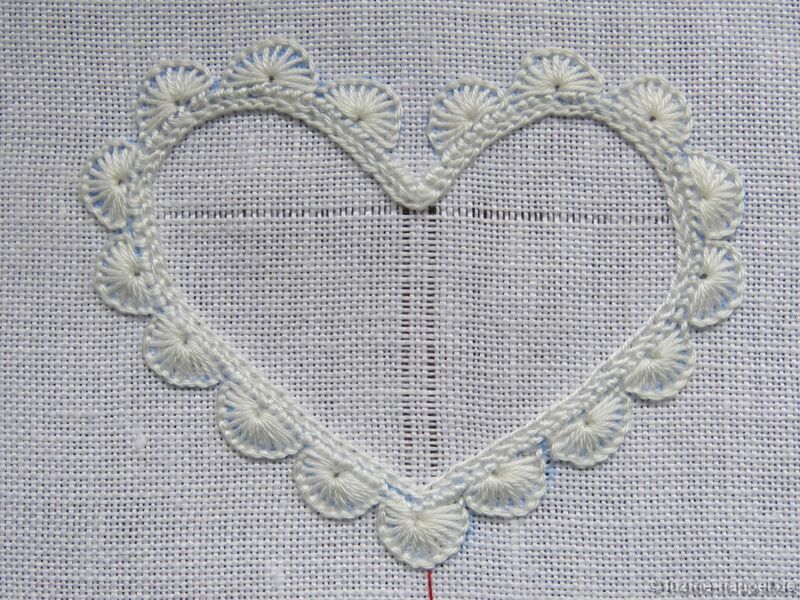 Tulips, hearts, and some other shapes are axially symmetric; they need a group of three threads as the center axis from which the pattern can be established on both sides. 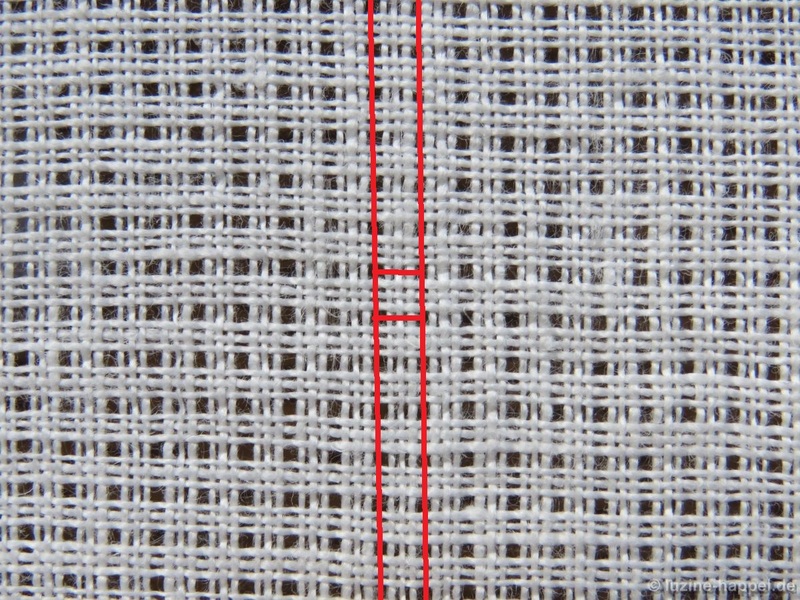 For both shape types, the center vertical thread and the two adjacent threads remain, and the next threads (1 to the left and 1 to the right) are withdrawn first. 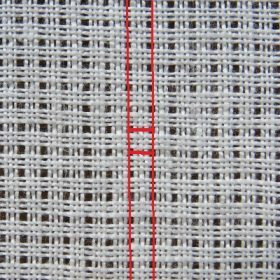 In point-symmetric shapes, the center horizontal thread and the two adjacent threads remain, and the next threads (1 above and 1 below) are now withdrawn to establish the center square. 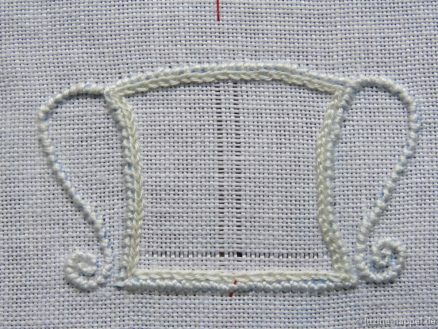 For axially-symmetric shapes there are some decisions to make before commencing to withdraw the horizontal threads; it depends on how a pattern should be arranged. Usually it can begin with the fourth thread from the bottom. 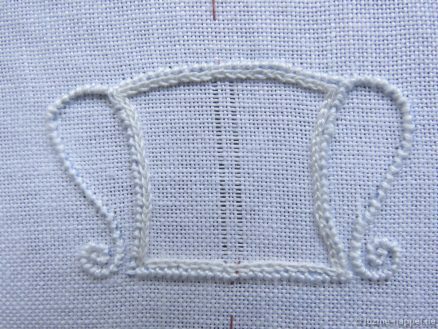 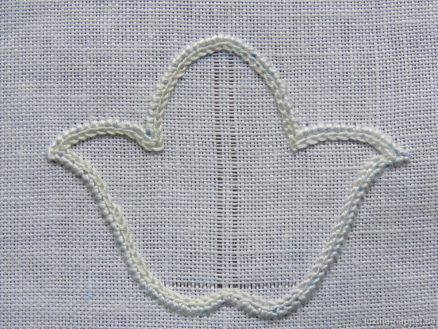 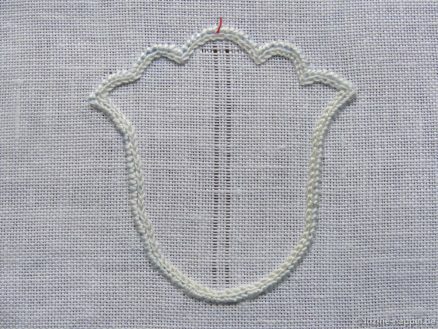 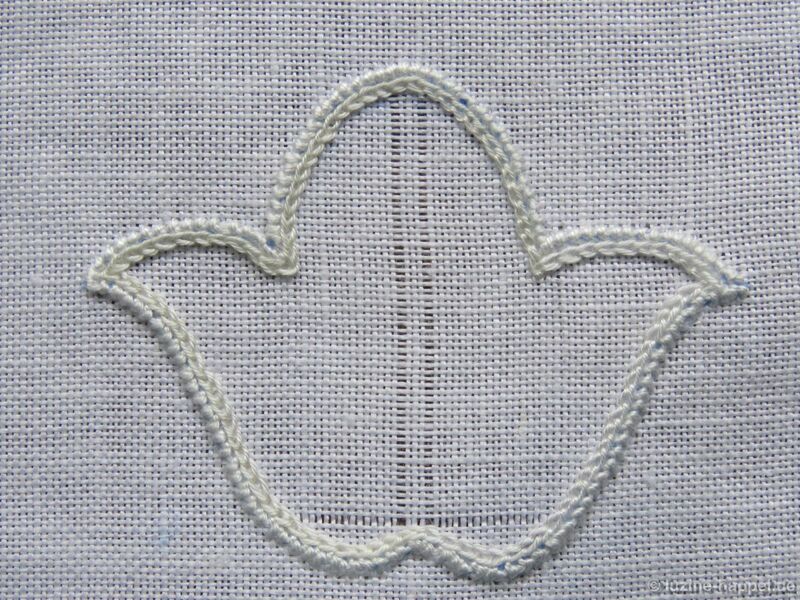 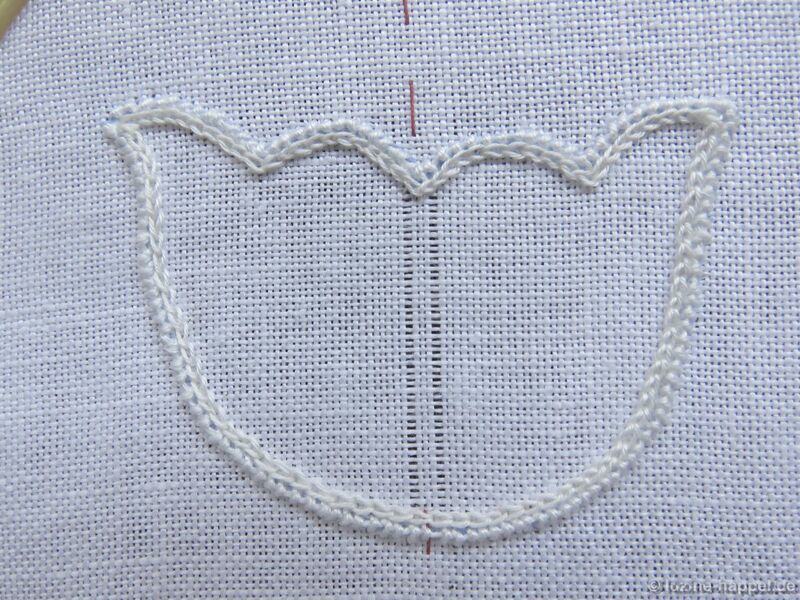 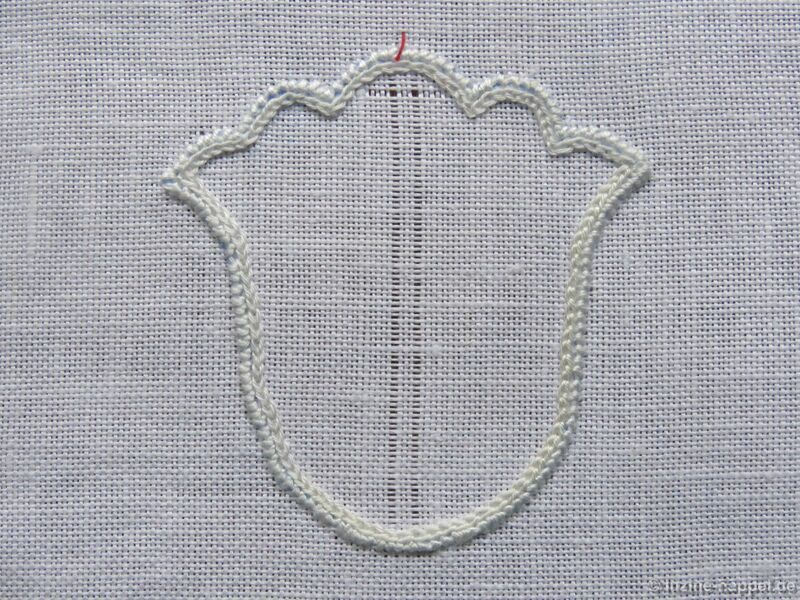 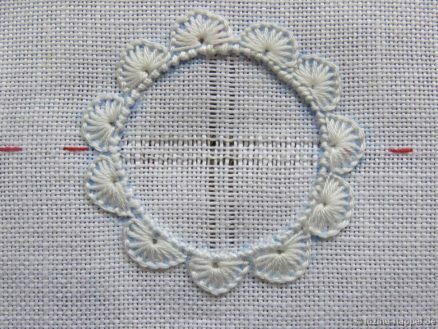 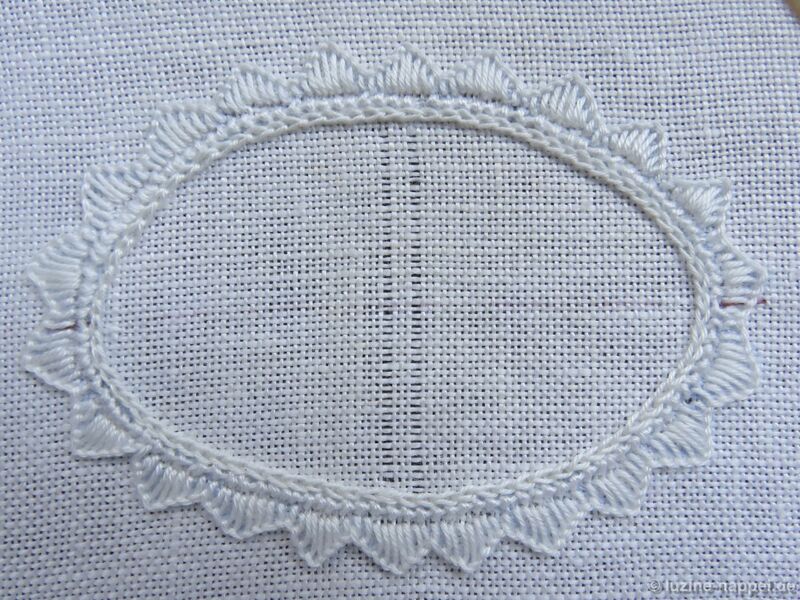 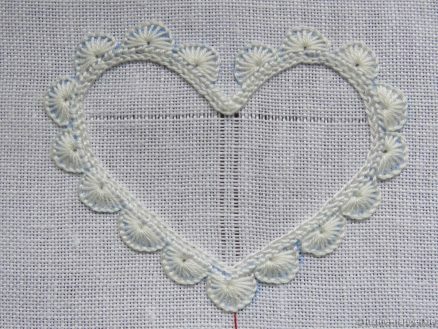 In some shapes, where the pattern should match the top outline, it begins with the fourth thread from the top of a shape. or directly above the bottom interior point. 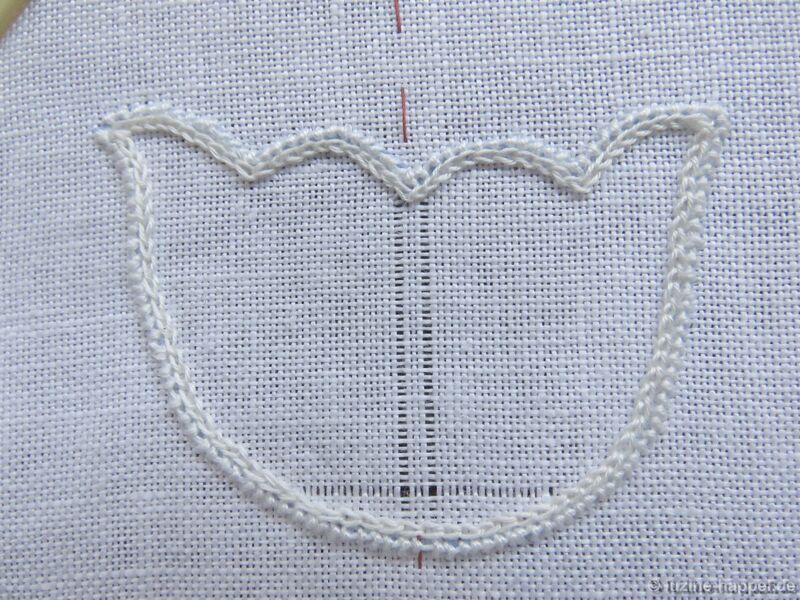 From the three just established withdrawn-thread lines (vertical and horizontal), the Limet grid is established by alternately leaving 3 (or sometimes 4) and cutting 1. 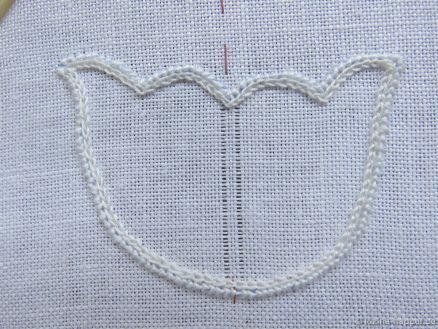 Below is a list of filling patterns (previously featured on this blog) that need this type of Limet grid.